Zone of the Enders is a video game franchise created by Hideo Kojima and game publisher Konami. 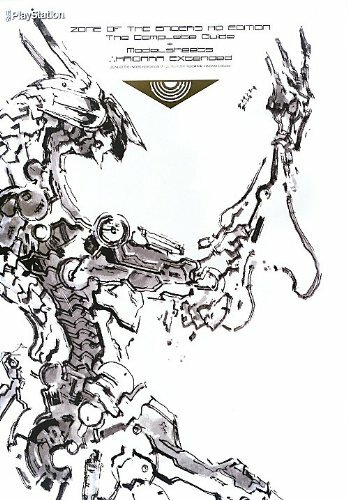 The cover are you see is by Yoji Shinkawa (新川洋司) and he's also the same guy who designed for the Metal Gear Solid series. The first game was actually released in 2001. The sequel Zone of the Enders: The 2nd Runner came out in 2003. Then both games were released in as Zone of the Enders HD Collection in 2012 for PS3 and Xbox 360. The English title for this book is Zone of the Enders HD Edition: The Complete Guide + Model Sheets ∴HAIDARA EXtended. Everything is written in Japanese. There are 288 pages and about half features the concept art while the other is the illustrated walkthrough guide to both the games. The concept art covers the characters, mecha, cockpits and some of the spaceships. There are only a few characters but many designs. The mecha designs are pretty cool and has their own unique style compared to mechas from other games or films. Much of the art are detailed line sketches from various angles. The more finalised art appear in the walkthrough guides as 3D renders and also on the model sheet pages. The walkthrough is very detailed and has 3D maps with enemy locations, screenshots and commentary for all the scenes. There are three interviews behind and they are with director Noriaki Okamura and Shuyo Murata, sound composers Maki Kirioka and Akihiro Honda, and concept artists Yoji Shinkawa and Nobuyoshi Nishimura. It's a pretty good book if you like the game or mecha art.